Launch of a new era! Yesterday I wended my way (via Lewes, East Croydon and Norwood Junction) to Haggerston (yes, me neither. It's Shoreditch way, next stop up from Hoxton on the spanking new Overground line), to a canalside community enterprise cafe and conference centre, for the launch of the consultation on what is variously called 'the new waterways charity' or the 'transfer of BW to civil society'. Now, as my research interests in the day job revolve around public policy, politicians' use of concepts (like civil society, community, local...), and the role of community and voluntary groups in delivering policy, it struck me a while ago that the future of BW would make an excellent case study, and by making it the subject of my next research project, I could be producing something original and worthwhile, and hopefully interesting enough to me to sustain a long project. So for a few months I've been sketching the outline of what such a project - articles and a book, being the ultimate 'outputs' - would look like, and have been drafting a proposal and thinking about who to talk to. When I heard about the official launch of the consultation process, I knew it was an opportunity I couldn't miss (despite the need to be in Haggerston at ten in the morning!) and requested an invitation. The event was organised by DEFRA and the consultation document can be found on their website here. It certainly was worth going. I was one of the few women there (there was one from the British Canoe Union and I think all the others were from DEFRA) and most of course were there as interested parties, representing an organisation. People seemed interested in the proposed research, and willing to contribute - hopefully it should be valuable to all concerned. I got to meet Robin Evans, Tony Hales and Simon Salem of BW, as well as Roger Hanbury of the Waterways Trust and a very interesting and helpful civil servant. The relevant junior minister (natural environment), Richard Benyon, was there too, but I didn't get to meet him. He made the right noises and there seems to be a consensus than he is genuinely enthusiastic for the waterways - he represents Newbury, so he has one in his constituency. Naturally I went along in full cynic mode, but the general feeling was of a cautious welcome from all parties for the proposals, obviously with some caveats and ongoing concerns about funding, but an overall impression that this was the best option available in the circumstances. Unlike many other 'Big Society' policies, this one wasn't scribbled on the back of an envelope by the new government, but the bulk of it is the outcome of a few years of planning and preparation within BW and DEFRA - although if it is successful of course, it will forever be seen as the flagship of the Big Society. So it's a case of watch this space - and I for one will now be watching it very carefully. The picture is the front cover illustration from the consultation document; I wanted to copy the whole cover, but I couldn't. You will of course notice that there are no boats in it. I shall try not to read too much into that. I have no idea what else to call these. 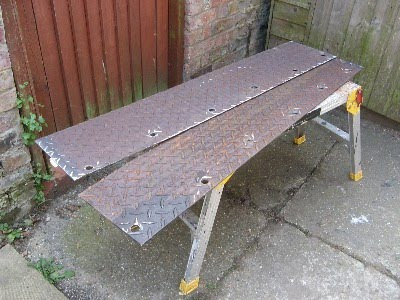 The idea is that when the oak gunnels are bolted on at the back end, these plates will be bolted underneath - that's underneath the gunnel iron, with big plate washers, rather than between the oak and the steel. They will then pick up some more planks, the same as the back end planks, extending forward far enough to cover the water tanks. The gunnels themselves will hold these planks in place. That is the theory. I hope that this derbar will be strong enough - if not we will have to fork out and actually buy some steel, whereas this cost hardly anything. The idea is that the extended boarded area will give us useful space for standing/sitting on, and getting on and off from, and hopefully my bicycle can live there too, chained to the back end rail. It's a bit of a fag hefting it out of the hold every time I want to go lockwheeling (and lifting it back in every time I want to stop) whereas wheeling it on and off a deck should be easy, and I will thus use it more often. Secondly, it will hide the plastic water tanks and make everthing a bit neater, with space to hide other stuff in between them as well. If you can see any hitches with this plan, please do let me know. Crucially, even if this doesn't prove to be strong enough, nothing will be welded or otherwise irrevocably attached to Chertsey's hull. All must be reversible, shall always be my motto. Last night saw the Canal World Southern Boaters in Exile banter, and if the Hope wasn't exactly full, it was a lot fuller than it would have been without us. Bantering boaters from across the south east descended upon Newhaven - including, but not limited to (unless my memory is far better than I think it is): Jelunga (Keith) and Judi; rjasmith (Richard) and Nessa; Bullfrog (David) and Ann, Ange and DaveL with Graham and Daphne; Alan Fincher and Catrin (Cath); Daftmare (Jo) and Kevin, and of course Paddington Bear (Jim), Chertsey, and Sebastian. 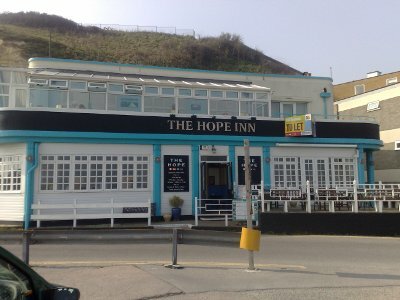 Everyone seemed to agree that the Hope was a good venue. The food was nothing out of the ordinary, but standard pub grub at a reasonable price was welcome enough, and a choice of Harveys Best or London Pride seemed to cater to most tastes. Everyone was jolly excited to see the Dieppe ferry make its stately passage past the window, seeming almost close enough to touch, and our friendly waves were accompanied by cries of 'SLOW DOWN!' Oh how we laughed. None of my photos of the merry throng came out very well, so here is one of the exterior of the pub that I prepared earlier - it was another nice sunny day. The building has seen a number of incarnations and extensions. Old photos on display inside show it in the nineteenth century as a standard bay fronted Victorian pub; in (presumably) the thirties it was extended with an ambitious moderne style exteripr, which in turn all but disappeared beneath a further conservatory style extension in (at a guess) the seventies. It's now to let, as the landlady (who did us proud) wants to retire. With the closure of the West Beach on its doorstep, it's hard to believe there's much hope for the future of the Hope. Well, the CanalWorld, that is. Today we are having a 'banter' at the Hope Inn, organised in aid of those poor souls who are trapped in the south east, miles from any useable canal. A 'canal boaters in exile' support group, if you like. I've got my glad rags on, and have painted my fingernails purple to hide the indelible traces of last week's Zebo-fest. And for those of you who can't make it, here are Diamond Geezer's wonderful photos of his recent visit. 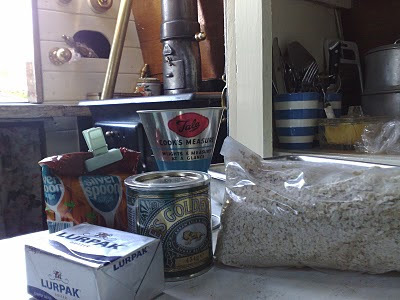 Amy Duck has her off grid baking challenge (seems to involve a lot of cup cakes, yum); I have now set about the Chertsey Back Cabin Baking Challenge. I have equipped myself by purchasing an oven thermometer, which tells me that the Epping's oven will comfortably reach a temperature of 150c without too much effort or excessive heat in the cabin; getting it hotter would be more of a challenge I think. I started out with something not too ambitious, but a favourite of mine: flapjack. I don't have scales on the boat, so I used my vintage Tala measure. On my last visit to Wilkinsons, I was delighted to see that these are still available (although I don't think the new design's so nice). I didn't think to look to see whether they'd updated the things you might want to measure - cous cous, perhaps, or polenta, instead of sago? Two in two weeks. Just as they're getting nicely worn in too. I had a pair from new once, when I was seventeen. Every pair since has been jumble sale, or, latterly, charity shop. These were two of my favourites; one was from the strange charity shop in Ramsey (can't even recall the name of it), the others from I know not where. Still, there are another four pairs in the cupboard waiting to be worn in, plus another four with 28" waists, waiting for me to get just that last little bit thinner. Forget the visit of the Duke of Edinburgh in 1992 (oh, you had) and even Prince Louis-Phillippe in 1848, or the deposit of Lord Lucan's borrowed car two roads down from our house en route to disappearing in 1974... Newhaven has had a visit from Diamond Geezer. It's given me a new perspective seeing the town (well, not the town centre, obviously, he's got more sense than that) through this super-blogger's eyes, and I think perhaps I appreciate my home town a little bit more. For a while anyway. I also learnt stuff that I'd failed to discover in twenty four years living here. So, better than I could ever put it (and far better researched), enjoy Newhaven Marine Station, Newhaven Fort, and a ten mile clifftop walk from Newhaven to Brighton. Sorry to have missed you dg. Back to Chertsey at last, for a spring clean and a look over before the season starts. Lots of little jobs out of the way and a lovely couple of days in the spring sunshine. The first job was to take the dynamo to a man in Hednesford to check it out and if necessary sort it out. You have never seen so many dynamoes and assorted bits in one place before. The trouble is, if the dynamo turns out to be OK, and it's the regulater at fault, then we will have to take that somewhere else. At present, the battery just isn't charging. On the other hand, we hardly notice, as we use so little power - we just take the battery home and charge it between trips, and we now have a spare too. One day, however, I would like some Grand Union style lights in the cabin, and with their 20w (or thereabouts, that was a wild guess actually because I've completely forgotten) bus bulbs, power consumprion will be a consideration. 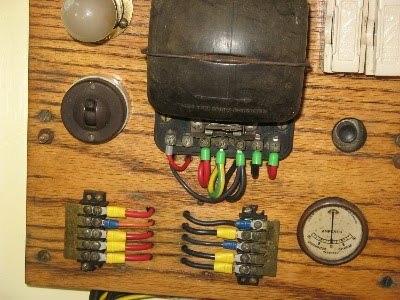 Still, an opportunity to post a gratuitous photo of Chertsey's electrical board, complete with ancient and still working bus bulb. Other jobs accomplished over the weekend included cleaning all the old leaves out of the hold, refitting the deckboard (needed because it's the mounting for the tunnel light); repainting and putting a liner in the chimney (still needs a bit of tweaking, that); cleaning and polishing everything, including the stove and all the cabin brass. Portholes next time! Jim made a pattern for a piece of steel to bolt under the gunnels at the back end so that we can extend the back end planks over the fresh water tanks. This will hide the tanks, and make a useful deck. All removable of course, absolutely no welding! Having been shown the under cloth conversion on Prince, I am now quite taken with creating a flexible, dark and cosy space under the cloths - but again, with no permanent or fixed superstructure. Certainy, the constant pumping out of rainwater and cleaning out of leaves (and frogs) brings home the advantages of having cloths! Finally, we attached the fenders. 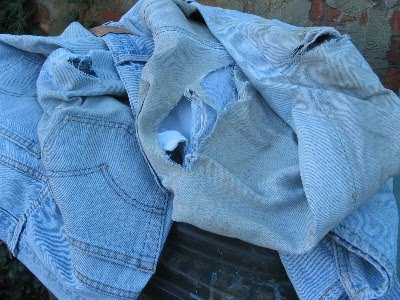 I would say re-attached, but these are not the same ones, the brand new ones that we bought last year at vast expense. Nope, they are now destined for Warrior (cor! New fenders!) while Chertsey now has Warrior's old ones, still in excellent condition and rejuvenated with a fresh soaking in creosote substitute. So why the swap? Because these ones were made by Joe Hollingshead, and belong on the old boat. Anyway, I must get in the bath now. More on the weekend's activities later. For all of you who've admired Warrior... 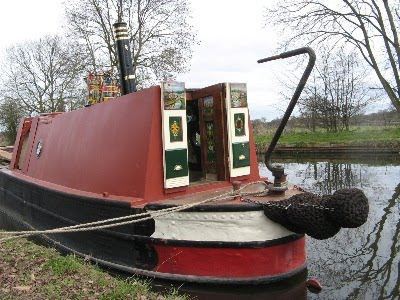 This lovely, well equipped, beautifully maintained, boat is now, reluctantly, for sale so that we can devote all our attentions to an enormous seventy-five year old rustbucket. (And, quite possibly, a small plastic tub with sails). Well, who said life was rational. Hours of hair-tearing went into compiling this irresistible Apollo Duck ad. Today we had another day out looking at sea boats. Little yachty motor-sailory sorts of things for bobbing up and down on the lumpy stuff. 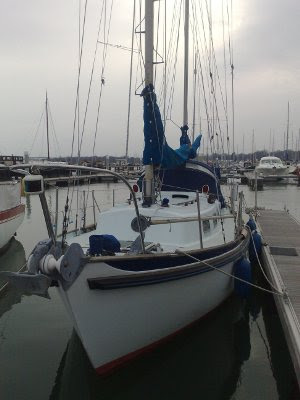 First stop Brighton Marina to check out a Colvic Watson 26 on brokerage there. Yep, it's nice; it looks like a boat... the trouble is, whatever boat I look at I can see the merits of, insofar as I can see any merits in the sort of boat where you can't get off and walk. 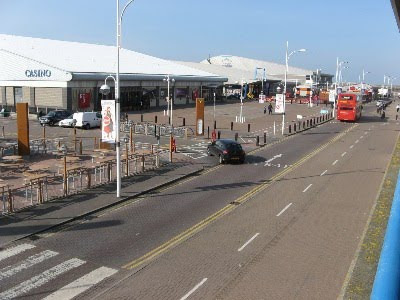 To get to the brokerage, we had to transit the surreally named 'Brighton Marina Village'. I've seen some bleak expanses in my time but I really think this took the biscuit. So inhuman, so ersatz, so bloody uncaring about anything - aesthetics, friendliness, nature - except hoovering in the maximum number of tasteless inhuman consumer-clones and their money. So this is what Black Rock and the sea swimming pool disappeared under all those years ago. 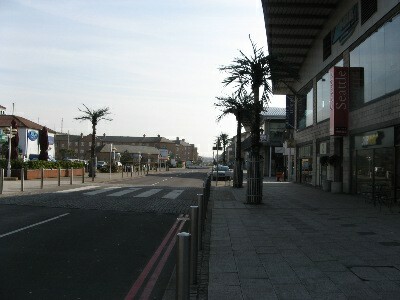 Asda-town, plastic onion domes on stuccoed quasi-pubs, dying palm trees, wind tunnel boulevards. I have seen the eighties, and it is still horrible. But we still had a lovely afternoon, bacause after that, we went on to the outskirts of Southampton to see a man about a dog. The Hon Sec of the Sea Dog Owners' Club, in fact, who had very kindly offered us the opportuinity to have a look at his 30' Sea Dog, a boat type which Jim was very taken with on paper. We met John and Audrey at their house, along with another man who had just bought a Sea Dog and had come to inspect John's gimbles, and were all driven to the marina where the boat (Two Tails - I think it's a law that all Sea Dogs have to have amusing canine-related names) resides. On board Audrey plied us with tea and lovely rock cakes while John showed us all the features and wrinkles of the boat, and his many ingenious modifications. They were lovely people, and we had a splendid time, and we have extended an invitation for a reciprocal visit to Chertsey, which I hope will be taken up. The Sea Dog was a very nice boat too. And I have decided that I want one of these, if anyone knows where to buy one. My work, of course, is neither unacceptable nor unpleasant; in fact I am incredibly lucky to have a job which is reasonably well paid and which gives me a lot of autonomy and flexibility. It is, however, expanding to fill the time available as cuts bite and more work has to be wrung out of fewer people. We full timers have been fortunate inasmuch as the promise of 'no redundancies' has held so far, but this has been possible at least partly because a lot of people on temporary contracts have not had them renewed, or have had their hours cut, and we now have to take their place. In practice this means a lot more teaching, and the associated preparation, which is far more time-consuming than you might imagine. Hence, I have not only not been writing lots of erudite articles and pushing back the frontiers of knowledge, I've not been doing a lot of blogging either. 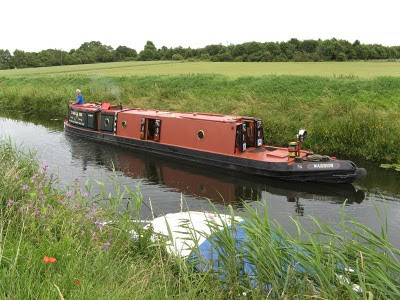 However, the end of term nears, and next term is all dissertation supervision rather than classroom teaching, so hopefully I will be a bit more flexible again, and will be able to get up to Chertsey for a grand spring clean next weekend, and then even some boating over Easter. A boaty weekend at last! Yes, this has been long overdue. I shall start with Saturday, which featured the AGM of HNBOC. As Jim is now on the committee as Fens rep, and the committee meeting prior to the AGM was acheduled to begin at ten o'clock, we left home at seven. Naturally, we were the first to arrive, and were admitted to Braunston Village Hall by a bemused cleaning lady. The committee meeting lasted from ten until twelve thirty. Lovely people, but very comprehensive. Then it was a mad dash down to the Plough for lunch (and I have now already equalled my February draft beer total), which was very slow in arriving, sadly, so had to be rather fast in the eating, in order to get back to a by now packed village hall for the 2.30 AGM. It wasn't the treasurer's splendid graphs they'd come to see however, but this year's honoured guest: Malcolm Braine and his very large collection of slides. So large in fact that we only got through half of them before it was nearly seven o'clock and time to vacate the hall. With a turnout of 150 it was standing room only at the back. It was certainly fascinating stuff, but what with the packed hall and the two lunchtime pints, slightly soporific too. There was a break for tea and cake half way through, and enlivened by several cups of the former and a couple of slices of the latter, and with the bonus of getting a seat vacated by a less hardy soul who left at half time, the second half, which kicked off with a marvellous piece of film of Claytons' tar boats, flew by. I also visited the club shop during the break and purchased a couple of second hand books to add to the library. Then we hit the A5 (eventually) and wended our way up and across to Chertsey's mooring ready to give the old girl a bit of long overdue TLC in the morning. Once again inspired, briefly, by Diamond Geezer's February count, I kept track of all the beer I drank during the month of February. I may even continue to do this, provided it doesn't make me look too much of a hopeless pisshead. There was only one visit to a pub (one! in a whole month!) so most of this was bottles, drunk either with my supper, or as a treat on arriving home after work. Draft: Three pints of Harveys Sussex Best Bitter, in the course of researching potential venues for a Canalworld Banter (of which more later). One in the King's Head, Lewes, and the rest over supper in the Hope Inn, Newhaven - our ultimate choice. 5 x Marstons Old Empire - This is my current favourite, strong and very hoppy. I think I'm becoming a bit if a fan of IPA in general, and this one in particular. 3 x St Peters Organic Ale - Very pleasant this; I noticed a slightly smokey finish (poser alert!!) the last time I had it. Chosen, as is so often the case, because it was on special offer in Sainsbury's. 2 x Bath Ales Barnstormer - Another Sainsbury's offer, not really my cup of tea - dark and a bit sweet and syrupy for my taste. 2 x Shepherd Neame Spitfire - My selection from the range of two available in the Whistlestop shop at Victoria Station (the other one being Speckled Hen at an even more inflated price) when I can't wait until I get home for my reward. 1 x Sainsbury's IPA - Disappointing, not much flavour. 1 x Sainsbury's Kentish Ale - Made by Shepherd Neame, not bad, but I wouldn't crawl over other stuff to get to it. 1 x Shepherd Neame Masterbrew - Naff name, 99p in Lidl, but not at all bad in fact. Have bought another case of eight bottles for the beer cupboard (yes, I thought that was a funny size case too). Whilst on the subject of comestibles, may I commend another blog and associated website to you: Tam and Di Murrell, who having run a narrow boat pair in the seventies, now have a barge in France, where they train other people on the art of having a barge in France whilst thoroughly enjoying lots of food and wine, and write about all of it beautifully. 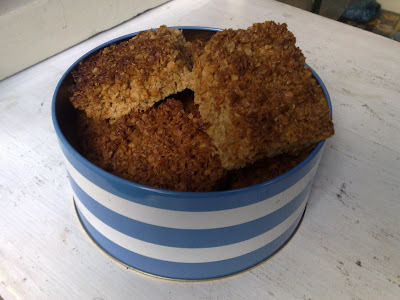 I can't give links to particular pages, but do go and have a browse, especially for the 'Good Old Days' post (October 14th) and the recipes.